Clarice Jamain at Simpson Marine tells me that Simon Theseira in their Malaysian office has signed two new motor yachts for sale - the 51.6m Matahari and the 24.2m Blue Dolphin of Sark. Matahari (ex Taipan III) was commissioned by the Emir of Bahrain and built by CRN in 1981. Simon sold her to the current owner last year, and he is now ready to upgrade to a bigger boat. She can accommodate 14 guests in 7 spacious staterooms, all with en-suite bathrooms. She features large and versatile entertainment areas including a 14 person dining salon, main salon with separate aft bar deck, sun deck and Jacuzzi area with built in permanent wet bar. As a conversation piece there is a boat house built in under the sun deck housing a 25' sportfisherman that is hydraulically lifted from its berth through the opening deck of the sun lounge and into the sea. She is a proven sea-going vessel and has been maintained to a very high level. 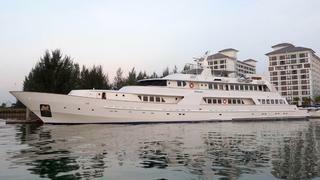 Currently lying in Port Dickson, Malaysia, she is asking $8,500,000. Simon's second new listing is Blue Dolphin of Sark, a Versilcraft Challenger 80'. Built in 1991, she has just arrived in SE Asia from the Med, following a major refit, and is in excellent condition. She can accommodate 8 guests in 4 well appointed cabins, including a large full beam master suite with a full size marble Jacuzzi. Blue Dolphin of Sark is asking $985,000.